On Bank Holiday Mondays we usually meet in the Coach Park at Crickley Hill Country Park from about 1pm so that members can operate in portable mode or test equipment in the field. Each session lasts about three hours and we are usually gone by 4pm. 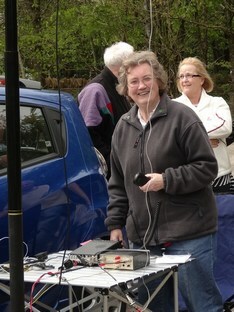 Why not come and see us, what we do and what Amateur Radio is all about? Crickley Hill Country Park is about 6 miles (10km) south of Cheltenham, close to the junction of the A417 and A436. From the Air Balloon public house and roundabout, which is on the junction, take the A436 which is signed to Oxford. After about 100yards (100m) turn left towards Cheltenham. The entrance to the Country Park is about 300 yards (300m) down the Cheltenham Road on the left. A long driveway goes uphill from the entrance and the coach park is on the right at the top of the hill. SatNav users may find the poscode of GL4 8JY useful although this is shared with the Air Balloon public house. The park itself does not appear to have a separate postcode. The Country Park makes a charge for parking. Please park in the area reserved for cars and then come to see us in the coach park at the top of the hill. GARES has a special arrangement with the country park that involves us in paying for the use of the coach park. Unfortunately, this arrangement is strictly for club members only.